YDF-DC-40/400-PM-TPR series is designed for operation without any power degradation in extremely high-peak-power cladding-pumped amplifiers. The new tapered fiber design have a single-mode end (typical dimension is 8/80 µm) for signal input and a very-large-mode-area end (typical dimension is 40/400 µm) for signal output and pump input. 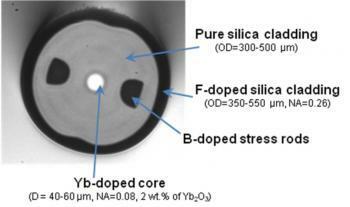 The all-glass double-clad fiber design (based on highly F-doped second cladding with typical NA=0.26) allow simple polishing of the thick 400 µm fiber end. 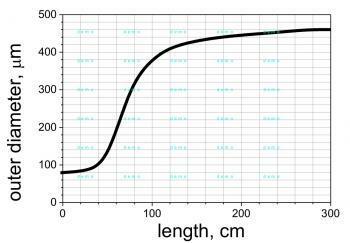 Due to a high Yb concentration and a short tapered fiber length amplifiers based on this fiber has the highest threshold of nonlinear effects over the market (up to 0.5 MW) together with the diffraction limited beam quality at the output.